Images from 1917 Suffolk Chronicle & Mercury Newspaper. Presumed dead: 3rd December 1917; age 26; KiA. Regiment: Royal Inniskilling Fusiliers, 2nd Battalion. Formerly 3/2 SR 14153, Royal Army Service Corps. 1901 37, Rendlesham Road, Ipswich. Philip Brunning, 40, a Baker & Pastry Cook – Restaurant, born Sudbury, Suffolk. Ann Brunning (nee Cheeseman), 38, born Black Notley, Essex. Philip Sidney Brunning, 16, an Errand Boy, born Ipswich. Ernest Joseph Brunning, 15, an Errand Boy, born Ipswich. Clara Annie Brunning, 8, born Ipswich. Laura Brunning, 4, born Ipswich. Leonard John Brunning, 3, born Ipswich. 1911 22, St. Margaret’s Street, Ipswich. Albert was 20 years old, a Baker & Confectioner. He was 1 of 2 servants for 34 year old, widow, Mary Ann Garnham, owner of a bakery business. Albert’s father Philip Brunning, died 1909, Ipswich. In 1916, Ipswich, Albert married Edith Ethel Cole, born 1890, Ipswich. Soldiers’ Effects to Edith Brunning – widow. 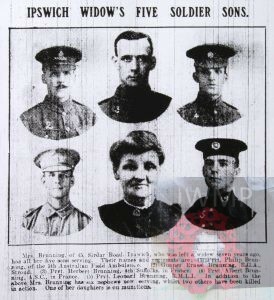 Mrs. Brunning, of 45, Sirdar Road, Ipswich, who was left a widow seven years ago, has all her sons serving. Their names and regiments are:- (1) Prvt. Philip Brunning, of the 5th Australian Field Ambulance. (2) Gunner Ernest Brunning, R.G.A., Stroud. (3) Prvt. Herbert Brunning, 4th Suffolks, in France. (4) Prvt. Albert Brunning, A.S.C., in France. (5) Prvt. Leonard Brunning, R.M.L.I. In addition to the above Mrs. Brunning has six nephews now serving, whilst two others have been killed in action. One of her daughters is on munitions.